Recap: If this match is remembered for anything it will be the absolute atrocious state of the pitch which all but prevented Palestine from passing their way into control. 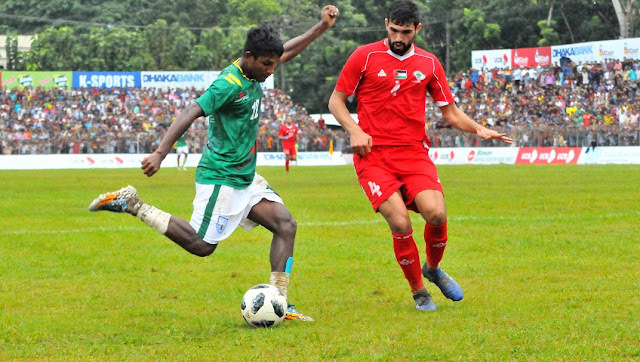 An early opening goal, courtesy of Mohammed Balah, gave Palestine the advantage and an insurance policy. On more than one occasion, Al-Fidai were caught out trying to pass back to Rami Hamadi or attempting clearances. A change in formation saw two true forwards on the pitch but with Salem and Balah not linking up as intended- the threat was effectively neutralized. Palestine were rewarded when they bypassed midfield but could not press their advantage with Oday Dabbagh and Khaled Salem sending several shots directly at the the Bangladeshi goalkeeper. Islam Batran's introduction in the final ten minutes gave Palestine a more threatening presence in attacks- with two efforts from Batran and Dabbagh whizzing low past the left and right posts in the final moments of the match. Palestine finally found a second goal, and a some much needed relief, deep into extra time when Sameh Maraaba finished from inside the box, following Oday Dabbagh's flicked header. The goal was Palestine's 200th goal in all FIFA competitions. The same player had goal #200 in all AFC competitions (accounting for a 9-0 match vs. Northern Mariana Islands) last year in a 8-1 thumping of Maldives. What I liked: The result. Palestine have strung together three clean sheets wins for only the second time in their history after beating Yemen, Maldives, and Bahrain last year. There will be no shortage of critics who will say this tournament has been a waste of time but Bangladesh proved to be stern opponents. Palestine had to play in a hostile environment, deal with a horrendous pitch, and navigate an opponent treating this friendly as their most important game of the year. It's hard to simulate a competitive environment in a friendly but Bangladesh provided a good test. Palestine can take this experience and apply it to World Cup qualifying which will begin in less than a year's time. What I didn't like: Wayward finishing for the second consecutive game meant this game was a lot closer than it needed to be. Palestine might have earned another clean sheet but there was a fair share of sloppy play in defence. There were opportunities for many a player to stake a claim to a spot with the national team but most those opportunities were squandered. Yazan Owaiwi, Mohammed Balah, and Khaled Salem remain long shots to make the Asian Cup squad. The more experienced Tamer Salah and Shadi Shaban are on shaky ground and may make the squad only due to a lack of alternatives. What's next: Palestine will face Tajikistan on Friday, October 12th at 4:30 PM Jerusalem time.